The members of LVFD regret to inform you of the passing of Life Member Burnell Grogg. Burnell joined the Lineboro Volunteer Fire Department in February 1941. 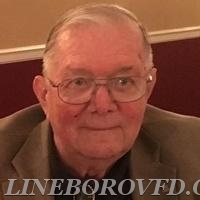 Burnell was Past President of the Lineboro Volunteer Fire Department, Past President of the Carroll County Volunteer Firemen's Association and was inducted into the CCVESA Hall of Fame in 2011. Burnell served in the Navy in World War II in the communications division. For most of his life, Burnell was an instrumental part of our department. He was a friend to many, and will be greatly missed. See the attached link for more information on Burnell, his family, and funeral services.